Exploration of 3 major pricing strategies with focus on competitors based one. Followed by a research for SaaS solutions, testing them and comparing to in-house development. This article is inspired by interesting case GRIN tech recently implemented for client store and somewhat confusing points of writing ranking for ‘ecommerce pricing strategy’ term. Later on I also decided to test available SaaS solutions to compare their results against those we got in-house. They say, it is 3 major ecommerce pricing strategies out there, i.e. they can be applied to all your inventory. As a bonus I discuss minor tactics as well, meaning they can be applied only to part of your inventory. It is as simple as that: add your margins, hope for the best. Probably not the best approach, taking into account that some say there are 12-24 million ecommerce site (only 650,000 generate annual sales of more than $1,000 thou). Of course you might be in a unique niche or have a killer value proposition but then why make it cost based rather than Apple-style your prices? Out of three this one is most vague sounding. Ultimately it seems to boil down to whether you have value-related or price-related products. In these terms high end fashion store can care less how they match the market, while selling gadgets is definitely the opposite case. In a nutshell you come up with a price for any given product satisfying you in terms of unit economy and then check your competitor’s’ price for exactly the same or very similar product. In my biased opinion, this is the most viable approach because one can a differentiate a lot within this paradigm via set of rules. If my price is higher, check for margins and do that etc. Whatever you chose, you will need to create a spreadsheet and fill in your top 10 competitors. Take most common query like “shop tennis rackets online” and fill in shops from first page. No need to scale if there are only 10 products in question, right? Search same products on those ten (or so) websites and fill in the spreadsheet. If you have a reasonable number of goods and don’t want to hustle, get some cheap workers from Amazon’s Mechanical Turk. Keep in mind, that manual check is good as a research starting point and you will not be able to automate that solution later. As you might guessed from the word “programmatically’ — this requires a coding of some sort. One can’t claim to be an awesome eCommerce-oriented web agency and just leave such struggle and tests to clients. See our research and tests below. In a nutshell, you ask your developer to parse competitors websites (category, product name, its link and its price), then you ask one to match your list with those parsed and put everything in one spreadsheet. I recommend to start slow and chose only one leading category to work with. What is important to realize is that doing such data mining and matching is one step away from automation. Would you go this extra step? A\B testing. Consider this though: purchases on only one item are not enough for proper statistics. Also, there is always a chance of a customer revisiting using another device and therefore seeing a different price. Stock-based pricing strategy. This strategy performs profit-oriented markdown management and works best for seasonal products (like winter coats) or products that become obsolete due to technology life cycles. Speaking about competitors-based pricing strategy it is essential to understand the means of implementation. As it was stated earlier, the choice is either SaaS, or in-house development. There is an astounding choice of cloud service providers. I found two fair looking listings with 71 companies in total, 70 of those — unique (Capterra’s listing & GetApp). So it boils down to costs of implementation and deliverables. Oh boy, how do you even make money on the web if you are not a SaaS company? Truth is, it really depends. Firstly, companies usually chose to track two competitors and settle in between. As a rule of thumb: I think there is no need to track more than 5 rival stores. Secondly, companies should not benchmark the whole catalog against their competitors, but prioritize instead. Options to do so include filtering highest selling products, highest popularity (equal to views), etc. Implement categorical thinking rather than SKUs or simply apply Pareto rule of 80/20. Therefore, I say such work does not require two full time engineers. For something like tennis.delivery catalogue (GRIN tech’s client project with over 4500 product positions) we needed to parse and automate only about 1500 positions. It took us 30 hours of coding to implement and tune-up the solution. I should note that a primary goal was to check how well our prices were in market and we got only few hundred matches, because client store has the biggest listing in the niche. We run the whole online-shop on 4GB RAM server and we didn’t have to scale it, even regardless of daily parsing. Support. Ok, you got that one. 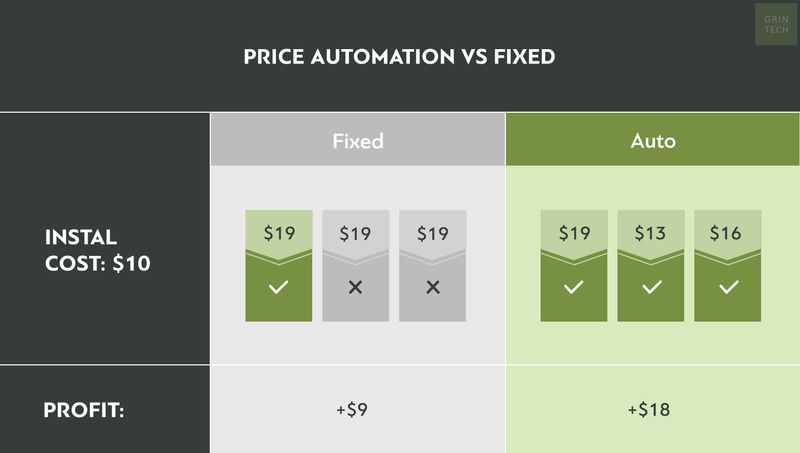 Nobody wants their price automation to go off the road in the middle of the night. Features list and – Integrations point sounds like milk-and-water to me. Manual price regulation is necessary, but has its limitations: you need personalization services to adjust prices in real time for each specific customer depending on their purchasing power. External personalization service is going to analyze each customer’s behavior: what products they view, what products they buy, do discounts matter for some of them, etc. Considering the fact that the service tracks users from all similar shops, that have such a personalization system — you get a precise customer profile. To adapt prices for a specific individual customer in real time. Depending on their paying capacity, one customer is going to see a lower price with a discount, while the other one will see a usual price with no discount. And to provide relevant products recommendations. Those who seek lower prices, are going to find a similar and cheaper product in recommendations. Recommendations are also personalized, depending on customer’s habits. Some online stores may find it difficult to determine their competitive advantages, while competing on a price field can be not enough to succeed, especially when you compete with big retailers. That’s when appealing delivery terms can become an ace up your sleeve, even if your competitors boast lower prices. Who manages delivery: logistic company or in-house delivery. Take time to monitor reviews on the logistic company in charge. It may be that there are several companies doing business with a store. Additional options: delivery to multiple addresses, delivery as a gift (packaging included). Delivery bonuses: thank you letters, bonus merchandise, various additional gifts (calendars, test samples of different products, etc). It is a common occurrence for an online store to drive prices lower, but compensate the profit with a paid delivery service. That’s how you can significantly improve competitiveness of your business — offering delivery terms that will be convenient and appealing to your customers. You work with customers’ loyalty: they love such “game mechanics” and will definitely come back to you to hunt down lower prices and get a discount once more. Some Russian shops not only do this, but also provide a partial cashback: if within 14 days after a purchase, the price of a product somehow drops, the shop pays the difference back to a customer. Disclaimer: research below does not use a rigid scientific approach or any unified assessment system. It is rather a compilation of subjective reviews in form of video record for their demos while others are in plain text and screenshots. I used two listings from Google’s first page as source of SaaS services to test. There were 71 companies in the Capterra and GetApp directories combined. Some of them are focused on industries rather than ecommerce or pricing automation for marketplaces like Amazon and eBay (so called ‘repricers’). I took top 20 from both listings and tested those that deal with online stores. See combined table below. Also, I’d like to point out that there certainly are enterprise level solutions like boomerangcommerce.com by former Amazon executive. None of the listings have it. Probably their marketers never got in touch. Anyway, this post focuses on small and medium sized online stores and such industrial monsters are out of consideration. Prisync $49 multipurpose Capterra Takes in any data you provide, which is good. You need to do data mining yourself, which is not. API adds 20% to your subscription cost and requires own devloper as well. Still, the best in list soltion. Nice support. PriceLab $50 ecommerce? Capterra Didn’t show up on scheduled demo. Wouldn’t recommend. Darwin Pricing $50 ecommerce Capterra Doesn’t seem to be a viable solution. Didn’t go further than installation screen. Wouldn’t recommend. Sorry folks, I do not have that big store right now to do tests. Do you? From the start I was bashed with necessity to manually enter products (!) and links to my own product pages and all competitors I want to track (!!!). Why though? 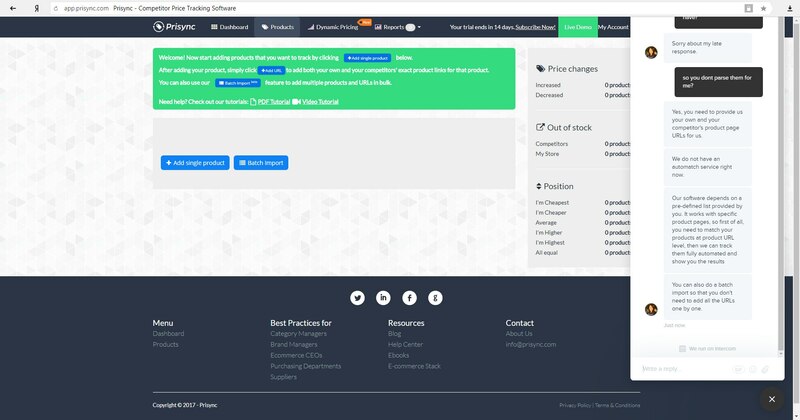 Pricelab is a significantly cheaper (starting at $20 a month) solution, but makes no real sense to use, since it lacks some vital features like competitor analysis and recommendation engine. Going with an in-house solution is definitely a better option. So it is more or less similar with some exceptions. And what about an in-house solution? An in-house solution may seem to be more complicated and expensive, while in reality it can easily prove to be not just a cheaper one, but also much more flexible. Its functionality is only limited by your demands and your programmer’s professionalism. External services provide quite a lot of features, but almost none provide all at once and none at all provide unlimited set of features. First thing you need to consider is hiring a programmer, who can handle the task of developing an in-house price regulation and personalization system. Prices may vary depending on your region, so before you take any further steps do a little research: check the prices of external services you consider using and the average hourly rate of a programmer in your region. Try evaluate how much each solution may cost you in the long term. Consider using Upwork to hire specialists that fit both your requirements and finances. We can help you calculate a cost sheet for your in-house solution, taking into account all your preferences, needs and, in case your budget is tight, help you adjust the scope of work accordingly. So, there are two important aspects to consider in pricing strategy: behavior of your competitors and interests of your customers. You can handle competitors manually, but customers definitely require an automated personalization approach. Use personalization platforms for ecommerce to adjust prices in real time. Choosing a solution depends on what is more effective both functionally and financially in your particular case.